BI Sentry empowers you to monitor, diagnose, and optimize SQL Server Analysis Services (SSAS) Multidimensional and Tabular modes. With BI Sentry, you gain unparalleled insight into SSAS performance issues, including bottlenecks related to memory and storage systems, aggregation usage, unoptimized queries, as well as query and processing tasks competing for the same resources. BI Sentry is a powerful SSAS monitoring solution providing actionable information so you can proactively address potential bottlenecks. The BI Sentry performance dashboard shows both Windows- and SSAS-specific metrics side by side for a complete view of data platform performance. As part of the SentryOne platform, BI Sentry gives a complete view of Microsoft SSAS performance so you can identify and address problems that have widespread impact across your data platform. Learn more about the new, extended support for SSAS Tabular in BI Sentry. The SentryOne BI Sentry Top Commands tab shows SQL Server Analysis Services (SSAS) query-level collection and any MDX, DAX, or XMLA commands that have run longer than one second. All the like queries have been rolled up and grouped together so you can see their total impact. Top Commands is one of many features in BI Sentry that helps you identify and address performance problems with SSAS. Learn more. SentryOne Advisory Conditions are a proactive alerting and response system that helps you customize notifications based on parameters that are specific to your environment. 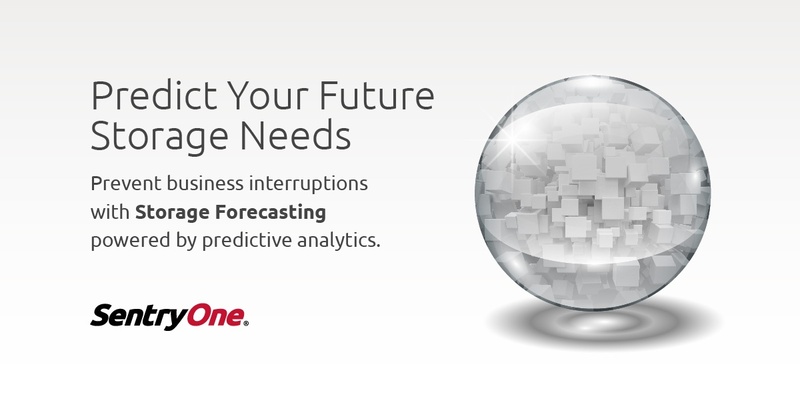 By using pre-built or customer Advisory Conditions, you can anticipate and prevent database performance problems. Learn more. The SSAS Performance Metrics displayed by the Performance Analysis Dashboard in SentryOne BI Sentry give you valuable insight into the root cause of performance problems with SQL Server Analysis Services (SSAS). With actionable information, you can save time in troubleshooting SSAS performance. Learn more. 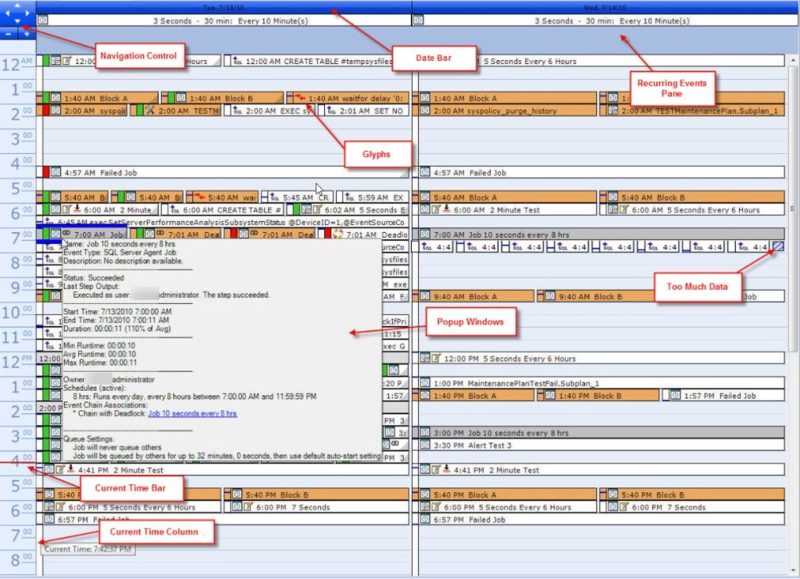 The SentryOne Event Calendar is a capability that combines both historical and future SQL Server and Windows event data in a visual, Outlook-style display. With the Event Calendar, you can identify and fix potential conflicts between multiple events—such as SQL Server jobs or Windows scheduled tasks—competing for the same resources, which can slow database performance. Learn more. Troubleshooting performance problems with SQL Server Analysis Services (SSAS) can be a frustrating exercise. Dive into this five-part guide by Steven Wright, Product Manager at SentryOne to learn time-saving tips for boosting SSAS performance. Keeping your Business Intelligence environment running at peak performance can be challenging and time-consuming, especially if you aren’t able to spend much time with Microsoft’s BI platform. But by focusing on a few key performance aspects of SQL Server Analysis Services (SSAS) and SQL Server Integration Services (SSIS), you can ensure your end users will quickly get the data they need to make business decisions. Troubleshooting performance problems with SQL Server Analysis Services (SSAS) can be a frustrating exercise—unless you know how to find the root cause of the problem. In this web seminar, Steven Wright will review some of the most common SSAS performance killers as well as useful metrics to monitor in SSAS Tabular model, which is now the default installation option in SQL Server 2017. SentryOne comes preconfigured with well over a hundred alerting conditions for failures, offline servers, long-running queries, and more. You may also be aware of SentryOne’s Advisory Conditions. This advanced alerting and response system allows you to truly customize the product to respond to any condition with complex logic based on performance counter thresholds, query results, and more. The Top Commands tab shows Analysis Services query level collection and any MDX, DAX, or XMLA commands that have run longer than one second. All the like queries have been rolled up and grouped together so you can see their total impact. Drill through to see individual queries and group by event class to do discovery on the grid data. 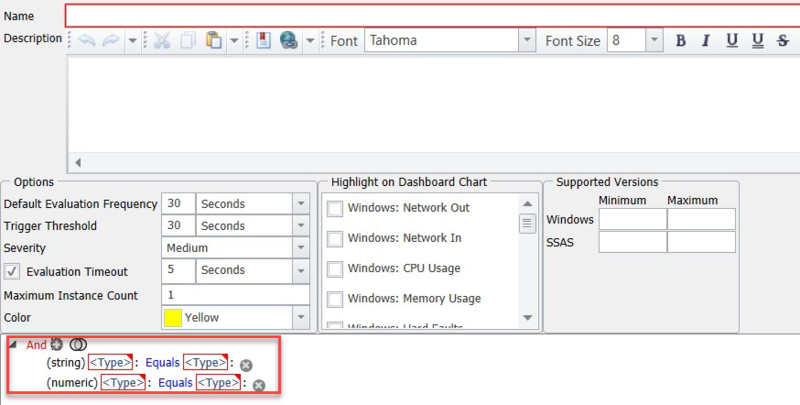 For SSAS Multidimensional instances, BI Sentry provides three tabs to help you analyze data usage. Learn about Attributes, Aggregations, Partitions, and also Object Memory Usage and Cardinality. SQL Sentry is the database performance monitoring solution of choice for Subway, Humana, Progressive Insurance, DocuSign—and many other companies with the highest performance demands for data delivery—because of unmatched scalability and enterprise-class capabilities, including Storage Forecasting. SQL Sentry has proven scalability far beyond competitors' products, with demonstrated success monitoring 800+ targeted database instances with one monitoring database. Our innovative use of SQL Server technology to scale monitoring to large enterprise workloads was the focus of a Microsoft profile. The article said that SentryOne "has shattered barriers to data ingestion and monitors its customer databases without impediment" and that SQL Sentry is built with current data management trends in mind. Hate being surprised by insufficient disk storage space, which could bring your databases to a standstill? Storage Forecasting in SQL Sentry takes the guesswork out of planning storage needs by applying machine learning to forecast daily usage for all storage volumes across servers, helping you proactively manage compute resources. The algorithms analyze workloads, fine-tune disk capacity forecasts, and provide intelligent reporting that can help prevent system downtime. SQL Sentry offers comprehensive support for SQL Server running in any environment, including Amazon RDS, Amazon EC2, Azure SQL DB Managed Instance, and SQL Server on Linux. Running SQL Server on Linux? 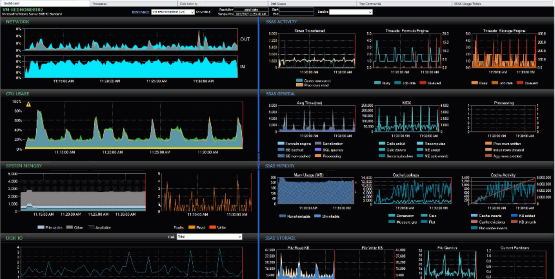 SQL Sentry provides powerful performance monitoring for SQL Server on Linux, whether you're running on Red Hat Enterprise Linux, SUSE Linux Enterprise Server, or Ubuntu. SQL Sentry provides industry-leading performance monitoring for SQL Server running on Amazon RDS and Amazon EC2, giving you performance metrics that go beyond what you'll see in Amazon CloudWatch. Exploring shifting databases to Azure SQL Database Managed Instance? SQL Sentry provides comprehensive performance monitoring for Managed Instance, which lets you retained key features of on-premises SQL Server. It's not just a good choice. It's the only complete SQL Performance Analysis tool out there." Ready to end your database performance problems? *License option requires year-one annual maintenance ($599) and provides technical support via e-mail and phone, software updates and version upgrades. Subscription pricing is based on a 12-month term paid in advance with automatic renewal at the end of the term. How many SSAS instances to quote? Need to monitor 5 or fewer SQL Server instances? Check out SQL Sentry Essentials, an edition of SQL Sentry for up to 5 database instances, priced at $995 per database instance.